Enjoy This Mouthwatering Collection Of Delicious Jamaican Recipes Cookbook. The Caribbean is a large region, containing many diverse island nations. Most of the islands were once colonies of Spain, France, the Netherlands or Britain, and hence the influence of these countries' cuisines can be seen in many Carribean dishes. Additionally, influences and ingredients from African cuisine, especially West African cuisine, can be seen in many dishes, this being the region from which many of the slaves imported to work on the sugar plantations, came from. The British in particular also brought many indentured laborers from India to the Caribbean, especially to Trinidad and Tobago, and here the influence of Indian cuisine can be seen too. Alcapurrias - A dish from Puerto Rico. It is made by placing meat or crab in a dough made from green bananas and taro root, and then frying. Callaloo - A dish meat from leaf vegetables (the leaf used varies between different Caribbean islands), with okra, and coconut milk, simmered down to a thick soup or stew. Other ingredients are often added such as meat, crayfish (sometimes known as "Caribbean lobster") and chopped onions. Chili peppers, garlic and spices are used to flavor the dish. Curried goat - Goat meat in a rich curry sauce. Curry chicken and roti - Indian-style curried chicken, with Indian-style bread ("roti") - particularly popular in Trinidad and Tobago. Jerk meat - Another dish from Jamaica, jerk meat is chicken flavored with a fiery mixture of spices which are together known as "Jamaican jerk spice". Ideally the meat is cooked on a charcoal grill, but it can be oven cooked when this is not possible. In Jamaica itself, the usual meats used are pork or goat. Among the Jamaican dispora overseas, jerk chicken is particularly popular. Arroz con gandules - Another dish from Puerto Rico. 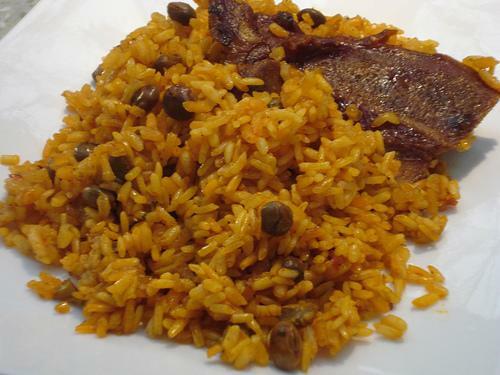 It is rice with pigeon-peas and smoked ham, and is flavored with sofrito (a thick cooked sauce). Mofongo - This popular dish from Puerto Rico is made from green plantains or cassava, which are fried with garlic, pork cracklings and olive oil. It is then mashed and served with meat or chicken soup. Rice and peas - Rice cooked with coconut and mixed with beans (such as pigeon-peas or red kidney beans) or peas. Salt fish and ackee - This is sometimes said to be the national of Jamaica, where it is actually most popular as a breakfast. The dish is prepared from salted cod, which is washed and rehydrated, and then sautéed together with boiled ackee (ackee is a type of fruit, originally from West Africa - it must be very carefully prepared, as if improperly prepared it can be poisonous). The dish also usually contains tomatoes and peppers, and is flavored with herbs and spices. Whether you make Jamaican Food for pleasure, for your job, or just the occasional one-off for Christmas Day, The �Jamaica Cooking� book can help you with Jamaican Food ideas, recipes, suppliers, news, and more. Over 1,500 authentic Jamaican Recipes in over 60 categories. Over 500 cooking tips and hints. A Jamaican glossary of over 2,000 terms. Downloadable in minutes! The ketogenic lifestyle has been proven to aid in weight loss and to help people achieve better overall health. Mellissa Sevigny, the voice behind the highly acclaimed food blog I Breathe, I’m Hungry, has been a leader in low-carb, ketogenic living for many years and understands the key factors to achieve lifelong success. In her new book, Keto for Life, she delivers a complete road map to adopting and sustaining a ketogenic diet. Keto for Life is a book for real people with busy lives, picky family members, and moderate budgets. Mellissa firmly believes that budget, time, and eating with loved ones should not be deterrents to living a keto lifestyle, feeling great, and enjoying the food you’re eating. Keto for Life gives readers tools and recipes to thrive on keto. People who are new to the ketogenic diet want answers to the common problems of how to eat keto without needing years of experience as prep cook in a commercial kitchen and how to stay within their grocery budget, keep the rest of the family from staging a mutiny, and not be forced to shop, prep, and cook full-time to make their goals a reality. Keto for Life educates readers on the do’s and don’ts of keto, providing a wealth of tips and strategies to help them get started right away and work toward their goals. Readers can pick up this book on a Monday and be well on the way to their new keto lifestyle by the weekend. In Afro-Vegan, renowned chef and food justice activist Bryant Terry reworks and remixes the favorite staples, ingredients, and classic dishes of the African Diaspora to present more than 100 wholly new, creative culinary combinations that will amaze vegans, vegetarians, and omnivores alike. Blending African, Carribean, and southern cuisines results in delicious recipes like Smashed Potatoes, Peas, and Corn with Chile-Garlic Oil, a recipe inspired by the Kenyan dish irio, and Cinnamon-Soaked Wheat Berry Salad with dried apricots, carrots, and almonds, which is based on a Moroccan tagine. Creamy Coconut-Cashew Soup with Okra, Corn, and Tomatoes pays homage to a popular Brazilian dish while incorporating classic Southern ingredients, and Crispy Teff and Grit Cakes with Eggplant, Tomatoes, and Peanuts combines the Ethiopian grain teff with stone-ground corn grits from the Deep South and North African zalook dip. There’s perfect potluck fare, such as the simple, warming, and intensely flavored Collard Greens and Cabbage with Lots of Garlic, and the Caribbean-inspired Cocoa Spice Cake with Crystallized Ginger and Coconut-Chocolate Ganache, plus a refreshing Roselle-Rooibos Drink that will satisfy any sweet tooth. With more than 100 modern and delicious dishes that draw on Terry’s personal memories as well as the history of food that has traveled from the African continent, Afro-Vegan takes you on an international food journey. Accompanying the recipes are Terry’s insights about building community around food, along with suggested music tracks from around the world and book recommendations. For anyone interested in improving their well-being, Afro-Vegan’s groundbreaking recipes offer innovative, plant-based global cuisine that is fresh, healthy, and forges a new direction in vegan cooking. After ten years of loving exploration, Rick Bayless, together with his wife, Deann, gave us Authentic Mexican, this now classic, easy-to-use compendium of our southern neighbor's cooking. This all-embracing cookbook offers the full range of dishes, from poultry, meat, fish, rice, beans, and vegetables to eggs, snacks made of corn masa, tacos, turnovers, enchiladas and their relatives, tamales, and moles, ending with desserts, sweets, and beverages. There are irresistible finger foods such as Yucatecan marinated shrimp tacos and crispy cheese-filled masa turnovers; spicy corn chowder and chorizo sausage with melted cheese will start off a special dinner; you will find mole poblano, charcoal-grilled pork in red-chile adobo, and marinated fish steamed in banana leaves for those times when you want to celebrate; and exotic ice creams, caramel custards, and pies to top off any meal. There's even a section devoted to refreshing coolers, rich chocolate drinks, and a variety of tequila-laced cocktails. Puerto Rican Cookery has become the standard reference on traditional native cookery (cocina criolla). According to the San Juan Star, "the cookbook is seen and is more likely better read in some homes than the religious tome. . . . [it] is considered a primer for beginning cooks . . . a textbook for home economists and it is a guide for the gourmet as well." "The foremost authority on Puerto Rican cooking is a silver haired, stylish, and warmly hospitable woman named Carmen Aboy Valldejuli . . . [her books] are considered today to be the definitive books on island cooking." Written entirely in Spanish, Cocina Criolla, the standard reference work on traditional Puerto Rican cooking, is in its 68th priniting and has special appeal to those who enjoy the island's cuisine. In addition to offering hundreds of delicious recipes, Cocina Criolla includes advice for the inexperienced cook that ranges from suggestions about the most efficient way to read a recipe to suggestions about what kitchen equipment every cook should have. Cocina Criolla no puede compararse con la generalidad de los libros de cocina. En muchos puntos difiere grandemente de ï¿½stos. Pero por su encaje perfecto en la necesidad actual de literatura culinaria prï¿½ctica y ï¿½til y por la forma detallada y caracterï¿½stica de sus rectas es, de por sï¿½, ï¿½nico en su clase. Cocina Criolla solucionarï¿½ muchas problemas domï¿½sticos y por lo tanto, estï¿½ llamad a ser un libro indespensable en el hogar. The English edition of this book, Puerto Rican Cookery, is in its 36th printing with more than 167,000 copies in print and is also available from Pelican. How to cook everything Latin American. Spice up your life with over 200 authentic Caribbean recipes—veganized! In this expanded, full-color second edition of Caribbean Vegan, Barbadian chef Taymer Mason shares 75 all-new recipes, including Caribbean Sushi, Brule Jol (avocado salad), and Breadfruit Ravioli with Calabaza Squash Filling. Plus, she explains the key kitchen skills she learned growing up: how to cut breadfruit, make your own cassava flour, choose a ripe coconut, and more. The islands await you . . .